"I'd feel better if the government was totally out of the loan business." shouldn't ask taxpayers to subsidize it, either." Today, RealClear Investigations, reporter James Varney, launches new oversight of the U.S. Small Business Administration (SBA) using our updated OpenTheBooks data. The focus? A special program that SBA officials would rather not discuss: lending to Wall Street! Since 2007, OpenTheBooks data shows $14 billion in guaranteed SBA financing to boutique investment firms, private equity, and large Wall Street Banks. The SBA is channeling billions of dollars to wealthy bankers at taxpayer backed low interest rates. Read the RealClear Investigations report, "Small Business Administration Channels Billions to Wall Street Firms." In 2014, OpenTheBooks exposed hundreds of millions of dollars in SBA financing to private country clubs; subdivisions of the Fortune 100; Bentley auto dealerships and the exclusive diamond brokers of Beverly Hills (90210). Then, we found $9.2 billion in guaranteed SBA financing to some of the most successful investment and private bankers in America. 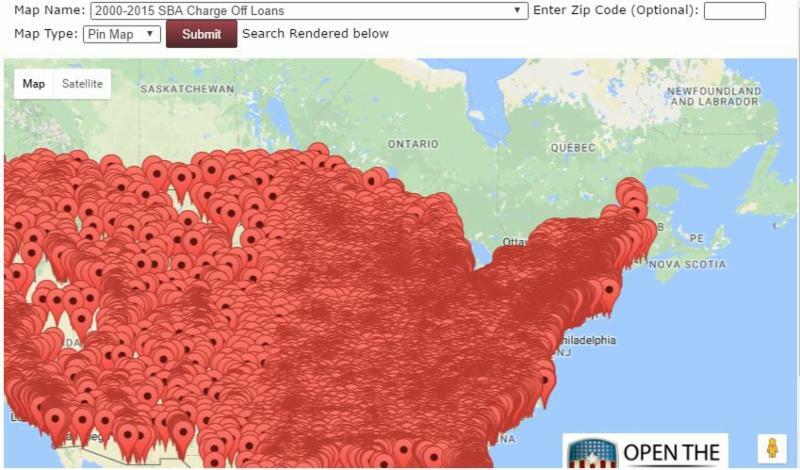 We mapped $24.2 billion in failed SBA loans. Track the SBA bad debt in your ZIP Code or across America.